To me “Catch Us If You Can” was a song and a car. More than enough to keep Dave Clark Five among my favourite groups in 1965. I never saw the movie, and yes, there was a movie. The Beatles did them, so did Gerry & The Pacemakers, so why not the guys from Tottenham? “Catch Us If You Can”, the movie, was the usual teenage garbage; a paper thin storyline, a handful of mediocre songs, and that was it. The Beatles had transformed the traditional teenage movie into a piece of witty pop art. Dave Clark Five had no such ambitions. But they had the car. The car was the movie. The fanciest, coolest car in the world at the time: the Jaguar E-type. It graced the sleeve of the album. It made me want that record so bad. The car appeared frequently in all the pictures of the band that year, in Fabulous, Rave, Pop Pics and all the other colourful English pop-mags that hung in the shop windows of my local news agent. “Catch Us If You Can”, the song, was infectious, the moment it entered your brain you were lost, there were no possible ways to get rid of it. Its subdued verses were sung over a cleverly suggestive sound of snapping fingers, cut short by an explosive round of machine-gun fire from Clark’s drums leading straight into the happy-go-lucky and slightly Beatle-ish chorus, a glorious lift-off that brought the listener above the clouds. It’s a perfect pop song and a perfect movie theme. The Monkees’ TV-series stole its theme song right out of Dave Clark Five’s pocket one year later. “(Theme From) The Monkees” is an exact carbon copy of “Catch Us If You Can”. 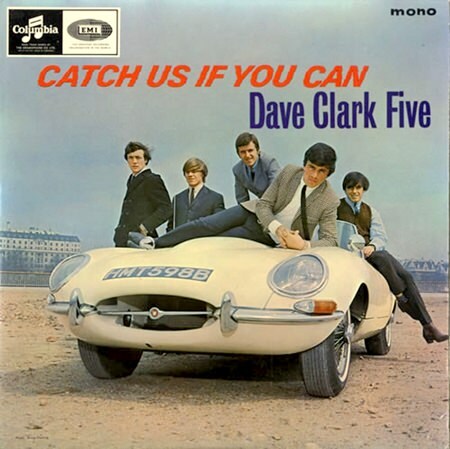 Dave Clark Five had other hits in 1965, some of them quite fabulous even, but none of them as cool as this one. I still don’t know what exactly that Jaguar was doin’ in the movie, maybe it was just there to make the band look good. It sure did in the pop magazines. I did not buy the LP, not because I didn’t want it mind you, but I had only small money. Albums were a luxury. Later, as a grown man, I invested in it. It is not a particularly startling palate of tunes. Being a typical hit parade outfit, Dave Clark Five’s LP’s were just rag bag collections of substandard tunes mixed with a couple of hits, if you were lucky. Filler material, the kind of stuff you’d expect to find on a single B-side. In 1965 most of it already sounded so 1964, so British Beat, so outdated. Things happened fast in the 60’s. However, there is not much to hold against the production which is clear and dynamic; it’s got a lot of bottom, the bass and the drums sound really good for their time. The band also had a strong voice in Mike Smith, and they were a coherent and accomplished ensemble, something the otherwise rather mediocre material benefits from. Most of the tracks are semi-fast pop songs, some bordering on ballads, often with a delicate backdrop of teenage sentimentality. Dave Clark was actually a smart and prescient dude. Signing their contract with Columbia records, he ensured that it gave him both the right to produce the band and the ownership of all master tapes. Not even The Beatles had such a control of their own careers. Dave Clark Five were pioneers in that respect. Clark was also smart enough to name the band after himself, a clever move as drummers normally were disposable, and this secured him a lifelong membership in the band. Dave Clark Five were self-declared exponents of “the Tottenham sound”, a challenge to the Merseybeat and Liverpool & Everton. Which proves that even if he was a clever guy, he didn’t know much about football. Dave Clark (born David Clark, 15 December 1942, Tottenham, North London, England), was the drummer. Mike Smith (born Michael George Smith, 6 December 1943, North Middlesex Hospital, Edmonton, North London – died 28 February 2008, Aylesbury, Buckinghamshire), was the lead vocalist and keyboardist. Lenny Davidson (born Leonard Arthur Davidson, 30 May 1944, Enfield, Middlesex) on lead guitar. Rick Huxley (born Richard Huxley, 5 August 1940, Livingstone Hospital, Dartford, Kent – died 11 February 2013) on bass guitar. Denis Payton (born Dennis Archibald West Payton, 11 August 1943, Walthamstow, East London – died 17 December 2006, in Bournemouth, Dorset) on tenor and baritone saxophones, harmonica, and guitar.